Around November-December 2012. I ordered what looked like a beginner’s box set with red and blue LW teams along with an EPL trophy and a ball with the Mitre logo on it. I’ve also ordered a couple more LW teams, around 4 at the time, to have some variation in teams and experimented the game with a friend. What are some memorable moments throughout your playing career? 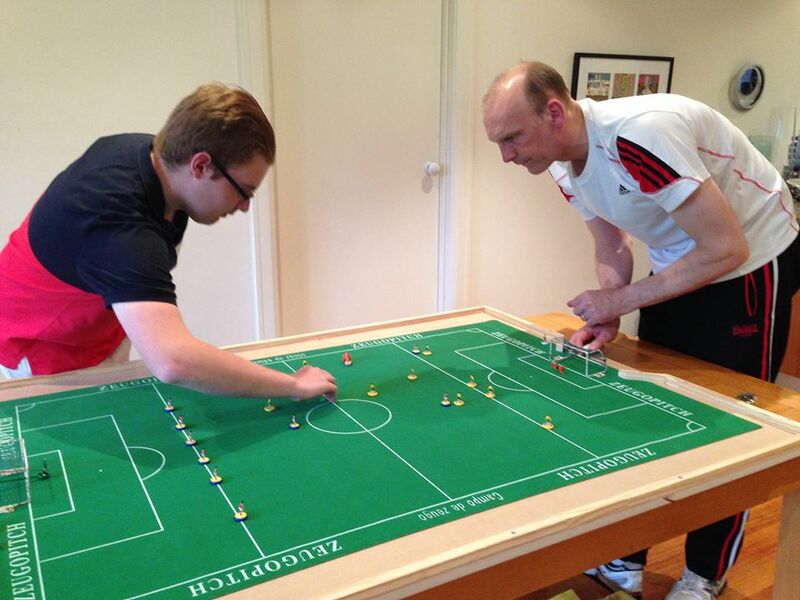 I think every subbuteo player’s memorable moment would be when they will win their first tournament, and so, in the early days of 2014, I hosted a tournament in my own home with 5 other players. It’s cheeky to say that the experienced players such as Carl Young and Peter Thomas were not able to join us, so there was a good chance for myself and other players to grab first place as we all had a similar skill level. I managed to come second only on goal difference and grinded my way throughout the final game. I must admit that Benji Batten had more playing experience than I have and somehow I fluked a chip shot to take the lead (which was recorded and uploaded on YouTube, where I just look like an absolute bell end when I celebrated) only to concede shortly after and narrowly held on to penalties. It was an underdog moment, some say I wasn’t destined to win but somehow my luck stayed with me and won the shootout. Benji got his revenge a month later when he came back to pick up his board from my house, we drew once and out played me twice. What do you enjoy the most about Subbuteo? Building a stadium together is one half of my passion with subbuteo, it’s slowly coming along and photos have been shared on the Melbourne Heart fan forum, Yarraside Facebook page and some are still up on the club’s Facebook group. The other is collecting as much teams I financially can, the ones that I like, familiar with and carry playing kits for my liking and trying them out in the tournaments. I think I own at least 20, 7 are HW teams which I hope to organise an old school, HW only tournament one day. Who is the toughest player you have played against? I would say Peter Thomas. Pulls off the most ridiculous flicks I have ever seen when I played against him. He crushed my confidence when there were times it looked impossible for him the get the ball and yet somehow, he keeps possession and scores within a blink of an eye. What is the best tournament you have played in? The tournament that I have hosted. Throughout the day there was never a moment of any negative energy from start to finish. It was the longest tournament time wise, so the longer the day goes, the better the experience is from playing the game. Above: one of Luke’s highly detailed stands which have received global acclaim within the Subbuteo Community. What team do you use/what bases are they on? I regularly use two teams when I play competitively. Why West Ham? I don’t support them, but their colours look the best in subbuteo, and I have educated myself about their club history and fan culture previously from picking up subbuteo. I like the club. Before you make any comments, I did not buy the whole box and pulled the bases apart. I found the figures on ebay being sold without their bases and were not boxed. A lot of them were sold from a particular store so I bought another 2 teams (Croatia 1998 and Shakhtar Donetsk).